(a) In developing countries, the share of population dependent on agriculture usually declines much more slowly compared to the decline in the sector’s share in GDP. (b) The number of people that the agricultural sector has to feed is increasing day by day. Today, about 2 million hectares of rainfed and irrigated agricultural lands are lost to production every year due to severe land degradation, among other factors. 1. Agriculture is a purely land based activity unlike secondary and tertiary activities. In other words, contribution of land in agricultural output is more compared to its contribution in the outputs in the other sectors. Thus, lack of access to land is directly correlated with incidence of poverty in rural areas. 2. Quality of land has a direct bearing on the productivity of agriculture, which is not true for other activities. 3. In rural areas, aside from its value as a productive factor, land ownership has a social value and serves as a security for credit, natural hazards or life contingencies, and also adds to the social status. In India, there is an urgent need to evolve and adopt land-saving technologies. Such technologies can be classified under two heads – those which raise the yield of any particular crop per unit area of land and those which increase the total output per unit area of land from all crops grown over one agricultural year by increasing land-use intensity. The advantage of the latter kind of technology is that along with increasing output from limited land, it also increases the demand for labour significantly. For a land scarce but labour abundant country like India, a high cropping intensity is desirable not only for fuller utilisation of land resource, but also for reducing unemployment in the rural economy. There are three distinct crop seasons in the northern and interior parts of country, namely kharif, rabi and zaid. The kharif season largely coincides with Southwest Monsoon under which the cultivation of tropical crops such as rice, cotton, jute, jowar, bajra and tur is possible (sown during April-July, and harvested by October). The rabi season begins with the onset of winter in October-November and ends in March-April. The low temperature conditions during this season facilitate the cultivation of temperate and subtropical crops such as wheat, gram and mustard. Zaid is a short duration summer cropping season beginning after harvesting of rabi crops. The Zaid consists of vegetables and low grade cereals sown in March or April and reaped before June. The cultivation of watermelons, cucumbers, vegetables and fodder crops during this season is done on irrigated lands. However, this type of distinction in the cropping season does not exist in southern parts of the country. Here, the temperature is high enough to grow tropical crops during any period in the year provided the soil moisture is available. Therefore, in this region same crops can be grown thrice in an agricultural year provided there is sufficient soil moisture. On the basis of main source of moisture for crops, the farming can be classified as irrigated and rainfed. There is difference in the nature of irrigated farming as well based on objective of irrigation, i.e. protective or productive. The objective of protective irrigation is to protect the crops from adverse effects of soil moisture deficiency which often means that irrigation acts as a supplementary source of water over and above the rainfall. The strategy of this kind of irrigation is to provide soil moisture to maximum possible area. Productive irrigation is meant to provide sufficient soil moisture in the cropping season to achieve high productivity. In such irrigation the water input per unit area of cultivated land is higher than protective irrigation. Rainfed farming is further classified on the basis of adequacy of soil moisture during cropping season into dryland and wetland farming. In India, the dryland farming is largely confined to the regions having annual rainfall less than 75 cm. These regions grow hardy and drought resistant crops such as ragi, bajra, moong, gram and guar (fodder crops) and practise various measures of soil moisture conservation and rain water harvesting. In wetland farming, the rainfall is in excess of soil moisture requirement of plants during rainy season. Such regions may face flood and soil erosion hazards. These areas grow various water intensive crops such as rice, jute and sugarcane and practice aquaculture in the fresh water bodies. The cereals occupy about 54 per cent of total cropped area in India. The country produces about 11 per cent cereals of the world and ranks third in production after China and U.S.A. India produces a variety of cereals, which are classified as fine grains (rice, wheat) and coarse grains (jowar, bajra, maize, ragi) etc. Rice is a staple food for the overwhelming majority of population in India. Though, it is considered to be a crop of tropical humid areas, it has about 3,000 varieties which are grown in different agro-climatic regions. These are successfully grown from sea level to about 2,000 m altitude and from humid areas in eastern India to dry but irrigated areas of Punjab, Haryana, western U.P. and northern Rajasthan. 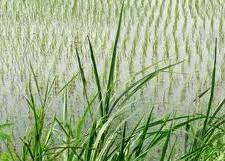 In southern states and West Bengal the climatic conditions allow the cultivation of two or three crops of rice in an agricultural year. But in Himalayas and northwestern parts of the country, it is grown as a kharif crop during southwest Monsoon season. India contributes 22 per cent of rice production in the world and ranks second after China. About one-fourth of the total cropped area in the country is under rice cultivation. West Bengal, Punjab, Uttar Pradesh, Andhra Pradesh and Tamil Nadu were five leading rice producing states in the country in 2002-03. Wheat is the second most important cereal crop in India after rice. India produces about 12 per cent of total wheat production of world. It is primarily a crop of temperate zone (North India lies in north temperate zone). Hence, its cultivation in India is done during winter i.e. rabi season. About 85 per cent of total area under this crop is concentrated in north and central regions of the country i.e. Indo-Gangetic Plain, Malwa Plateau and Himalayas up to 2,700 m altitude. Being a rabi crop, it is mostly grown under irrigated conditions. But it is a rainfed crop in Himalayan highlands and parts of Malwa plateau in Madhya Pradesh. About 14 per cent of the total cropped area in the country is under wheat cultivation. Uttar Pradesh, Punjab, Haryana, Rajasthan and Madhya Pradesh are five leading wheat producing states. The yield level of wheat is very high (above 4,000 k.g. per ha) in Punjab and Haryana whereas, Uttar Pradesh, Rajasthan and Bihar have moderate yields. Pradesh. It is sown in both kharif and rabi seasons in southern states. But it is a kharif crop in northern India where it is mostly grown as a fodder crop. South of Vindhyachal it is a rainfed crop and its yield level is very low in this region. maize is higher than other coarse cereals. It is high in southern states and declines towards central parts. Pulses are a very important ingredient of vegetarian food as these are rich sources of proteins. These are legume crops which increase the natural fertility of soils through nitrogen fixation. India is a leading producer of pulses and accounts for about one-fifth of the total production of pulses in the world. The cultivation of pulses in the country is largely concentrated in the drylands of Deccan and central plateaus and northwestern parts of the country. Pulses occupy about 11 per cent of the total cropped area in the country. Being the rainfed crops of drylands, the yields of pulses are low and fluctuate from year to year. Gram and tur are the main pulses cultivated in India. Gram is cultivated in subtropical areas. It is mostly a rainfed crop cultivated during rabi season in central, western and northwestern parts of the country. Just one or two light showers or irrigations are required to grow this crop successfully. It has been displaced from the cropping pattern by wheat in Haryana, Punjab and northern Rajasthan following the green revolution. At present, gram covers only about 2.8 per cent of the total cropped area in the country. Madhya Pradesh, Uttar Pradesh, Maharashtra, Andhra Pradesh and Rajasthan are the main producers of this pulse crop. The yield of this crop continues to be low and fluctuates from year to year even in irrigated areas. Tur is the second important pulse crop in the country. It is also known as red gram or pigeon pea. It is cultivated over marginal lands and under rainfed conditions in the dry areas of central and southern states of the country. This crop occupies only about 2 per cent of total cropped area of India. Maharashtra alone contributes about one-third of the total production of tur. India is the largest producer and consumer of Red gram in the world. Red gram accounted for about 20 percent of the total pulse production of the country. India produces about 17 per cent the total of groundnut production in the world. It is largely a rainfed kharif crop of drylands. But in southern India, it is cultivated during rabi season as well. It covers about 3.6 per cent of total cropped area in the country. Gujarat, Tamil Nadu, Andhra Pradesh, Karnataka and Maharashtra are the leading producers. Rapeseed and mustard comprise several oilseeds as rai, sarson, toria and taramira. These are subtropical crops cultivated during rabi season in north-western and central parts of India. These are frost sensitive crops and their yields fluctuate from year to year. But with the expansion of irrigation and improvement in seed technology, their yields have improved and stabilised to some extent. These crops provide us fibre for preparing cloth, bags, sacks and a number of other items. Cotton and jute are two main fibre crops grown in India. Cotton is a tropical crop grown in kharif season in semi-arid areas of the country. India lost a large proportion of cotton growing area to Pakistan during partition. However, its acreage has increased considerably during the last 50 years. India grows both short staple (Indian) cotton as well as long staple (American) cotton called ‘narma’ in north-western parts of the country. Cotton requires clear sky during flowering stage. Leading producers of this crop are Maharashtra, Gujarat, Andhra Pradesh, Punjab and Haryana. In India ranks fourth in the world in the production of cotton after China, U.S.A. and Pakistan and accounts for about 8.3 per cent of production of cotton in the world. Cotton occupies about 4.7 per cent of total cropped area in the country. Jute is used for making coarse cloth, bags, sacks and decorative items. It is a cash crop in West Bengal and adjoining eastern parts of the country. India lost large jute growing areas to East Pakistan (Bangladesh) during partition. At present, India produces about three-fifth of jute production of the world. West Bengal accounts for about three-fourth of the production in the country. Bihar and Assam are other jute growing areas. Being concentrated only in a few states, this crop accounts for only about 0.5 per cent of total cropped area in the country. Sugarcane is a crop of tropical areas. Under rainfed conditions, it is cultivated in sub-humid and humid climates. But it is largely an irrigated crop in India. In Indo-Gangetic plain, its cultivation is largely concentrated in Uttar Pradesh. Sugarcane growing area in western India is spread over Maharashtra and Gujarat. India is the second largest producer of sugarcane after Brazil. It accounts for about 23 per cent of the world production of sugarcane. But it occupies only 2.4 per cent of total cropped area in the country. Tea is a plantation crop used as beverage. Black tea leaves are fermented whereas green tea leaves are unfermented. Tea leaves have rich content of caffeine and tannin. It is an indigenous crop of hills in northern China. It is grown over undulating topography of hilly areas and welldrained soils in humid and sub-humid tropics and sub-tropics. In India, tea plantation started in 1840s in Brahmaputra valley of Assam which still is a major tea growing area in the country. Later on, its plantation was introduced in the sub-Himalayan region of West Bengal (Darjiling, Jalpaiguri and Cooch Bihar districts). Tea is also cultivated on the lower slopes of Nilgiri and Cardamom hills in Western Ghats. Assam accounts for about 53.2 per cent of the total cropped area and contributes more than half of total production of tea in the country. West Bengal and Tamil Nadu are the other leading producers of tea. At present, India ranks third among tea exporting countries in the world. Coffee is a tropical plantation crop. Its seeds are roasted, ground and are used for preparing a beverage. There are three varieties of coffee i.e. arabica, robusta and liberica. India mostly grows superior quality coffee, arabica, which is in great demand in International market. But India produces only about 4.3 per cent coffee of the world and ranks sixth after Brazil, Vietnam, Colombia, Indonesia and Mexico. Coffee is cultivated in the highlands of Western Ghats in Karnataka, Kerala and Tamil Nadu. Karnataka alone accounts for more than two third of total production of coffee in the country. Agriculture continues to be an important sector of Indian economy. In 2001 about 53 per cent population of the country was dependent on it. The importance of agricultural sector in India can be gauged from the fact that about 57 per cent of its land is devoted to crop cultivation, whereas, in the world, the corresponding share is only about 12 per cent. In spite of this, there is tremendous pressure on agricultural land in India, which is reflected from the fact that the land-human ratio in the country is only 0.31 ha which is almost half of that of the world as a whole (0.59 ha). Despite various constraints, Indian agriculture has marched a long way since Independence. Indian agricultural economy was largely subsistence in nature before Independence. It had dismal performance in the first half of twentieth century. This period witnessed severe droughts and famines. During partition about one-third of the irrigated land in undivided India went to Pakistan. This reduced the proportion of irrigated area in Independent India. After Independence, the immediate goal of the Government was to increase foodgrains production by (i) switching over from cash crops to food crops; (ii) intensification of cropping over already cultivated land; and (iii) increasing cultivated area by bringing cultivable and fallow land under plough. Initially, this strategy helped in increasing foodgrains production. But agricultural production stagnated during late 1950s. To overcome this problem, Intensive Agricultural District Programme (IADP) and Intensive Agricultural Area Programme (IAAP) were launched. But two consecutive droughts during mid-1960s resulted in food crisis in the country. Consequently, the foodgrains were imported from other countries. New seed varieties of wheat (Mexico) and rice (Philippines) known as high yielding varieties (HYVs) were available for cultivation by mid-1960s. India took advantage of this and introduced package technology comprising HYVs, along with chemical fertilizers in irrigated areas of Punjab, Haryana, Western Uttar Pradesh, Andhra Pradesh and Gujarat. Assured supply of soil moisture through irrigation was a basic pre-requisite for the success of this new agricultural technology. This strategy of agricultural development paid dividends instantly and increased the foodgrains production at very fast rate. This spurt of agricultural growth came to be known as ‘Green Revolution’. This also gave fillip to the development of a large number of agro-inputs, agro-processing industries and small-scale industries. This strategy of agricultural development made the country self-reliant in foodgrain production. But green revolution was initially confined to irrigated areas only. This led to regional disparities in agricultural development in the country till the seventies, after which the technology spread to the Eastern and Central parts of the country. The Planning Commission of India focused its attention on the problems of agriculture in rainfed areas in 1980s. It initiated agro-climatic planning in 1988 to induce regionally balanced agricultural development in the country. It also emphasised the need for diversification of agriculture and harnessing of resources for development of dairy farming, poultry, horticulture, livestock rearing and aquaculture. Initiation of the policy of liberalisation and free market economy in 1990s is likely to influence the course of development of Indian agriculture. Lack of development of rural infrastructure, withdrawal of subsidies and price support, and impediments in availing of the rural credits may lead to inter-regional and inter-personal disparities in rural areas. Growth of Agricultural Output and Technology There has been a significant increase in agricultural output and improvement in technology during the last 65 years. • Production and yield of many crops such as rice and wheat has increased at an impressive rate. Among the other crops, the production of sugarcane, oilseeds and cotton has also increased appreciably. India ranks first in the production of pulses, tea, jute, cattle and milk. It is the second largest producer of rice, wheat, groundnut, sugarcane and vegetables. of seeds, chemical fertilizers, pesticides and farm machinery. The net irrigated area in the country has increased from 20.85 to 54.66 million ha over the period 1950-51 to 2000-01. • Modern agricultural technology has diffused very fast in various areas of the country. Consumption of chemical fertilizers has increased by 15 times since mid-sixties. In 2001-02, per hectare consumption of chemical fertilizers in India was 91 kg which was equal to its average consumption in the world (90 kg). But the yield of the crops in the country is low in comparison to the international level. Per hectare output of most of the crops such as rice, wheat, cotton and oilseeds in India is much lower than that of U.S.A., Russia and Japan. Because of the very high pressure on the land resources, the labour productivity in Indian agriculture is also very low in comparison to international level. The vast rainfed areas of the country, particularly drylands which mostly grow coarse cereals, pulses and oilseeds have very low yields. The inputs of modern agriculture are very expensive. This resource intensive approach has become unmanageable for marginal and small farmers as they have very meagre or no saving to invest in agriculture. To tide over these difficulties, most of such farmers have resorted to availing credit from various institutions and money lenders. Crop failures and low returns from agriculture have forced them to fall in the trap of indebtedness. Irrigation covers only about 33 per cent of the cultivated area in India. The crop production in rest of the cultivated land directly depends on rainfall. Poor performance of south-west Monsoon can adversely affects the supply of canal water for irrigation. On the other hand, the rainfall in Rajasthan and other drought prone areas is too meagre and highly unreliable. Even the areas receiving high annual rainfall experience considerable fluctuations. This makes them vulnerable to both droughts and floods. Drought is a common phenomenon in the low rainfall areas which may also experience occasional floods. There are a large number of marginal and small farmers in the country. More than 60 per cent of the ownership holdings have a size smaller than one (ha). Furthermore, about 40 per cent of the farmers have operational holding size smaller than 0.5 hectare (ha). The average size of land holding is shrinking further under increasing population pressure. Furthermore, in India, the land holdings are mostly fragmented. The small size fragmented landholdings are uneconomic. Since scattered plots have adversely affected our agricultural productivity, the Govt. has tried to consolidate the holding through laws. Consolidation of holding aims at bringing together the small scattered pieces of land into compact units. This wil1 help in saving human energy and lowering operational cost of cultivation. Some of the state Govts. have started consolidation work since long. However, only one thirds of the total cultivable land have been so far consolidated. The consolidation work has been ful1y completed in Punjab and Haryana. There are some states where consolidation of holding has not been carried out even once. Even the states where it has been carried out once, second consolidation is required as land holdings have fragmented again in the process of division of land among the owners of next generations.